Approximately 2-years-old, Marco was recently pulled from a local high kill shelter and was slated to be euthanized. Marco who was rescued by volunteers saw his beautiful features and his warm personality decided to bring him to Save The Animals Rescue Team II, a local non-profit, no-kill, animal rescue group located in Englewood. 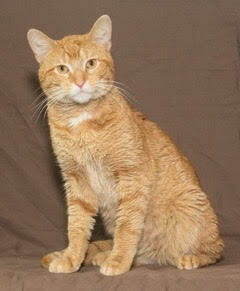 Marco is great with other cats and best of all, loves to play with dogs too. He is super friendly and just wants to be your next best friend. Marco is a short hair domestic cat who has a beautiful orange and white coat that is to be admired. He is curious of new surroundings and will make a dream addition to any cat lovers home. Marco is neutered and up to date on all of his routine shots. Marco and his friends are up for adoption at START II. If you are interested in meeting Marco, fill out an online application atwww.startii.org or call the shelter at 201-797-8861. Visit the shelter on Facebook at facebook.com/SaveTheAnimalsRescueTeamII.